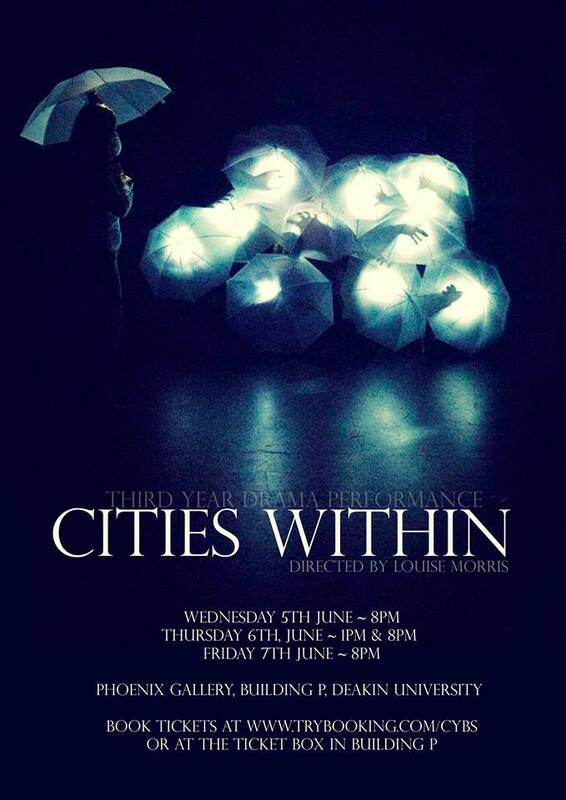 Today I’d like to share my extraordinary experience of seeing the university production, Cities Within, that my daughter and her drama class created, scripted, stage managed and performed. It’s always a pleasure to attend such events and soak in the vibrancy and passion that young people create. It was refreshing to feel the fever-pitch buzz of the cast who were animated in anticipation of their performance when I arrived. However this euphoric feeling quickly dissolved when the stage lights came on and the production commenced. The flawless staging woven within a frenetic soundtrack, Cities Within, is polished and worthy of any professional stage. The production is absent of significant dialogue and communicates with the visual and auditory senses of its audience by evoking emotions that audience members find difficult to explain. Cities Within creates an atmosphere, a flood of raw emotion that challenges people with feelings of vulnerability. The ambiance this play creates is one of haunting laced with deep despair. In the final act I felt a crushing sadness at the futility of society and the world we live in. As an older person I had to face the fact that this group of intelligent young people interpret life as mundane, cruel and worthless. The cast and crew create this pensive mood so beautifully and eloquently it is a unique experience that I will remember for a long time to come.